Hello friends! 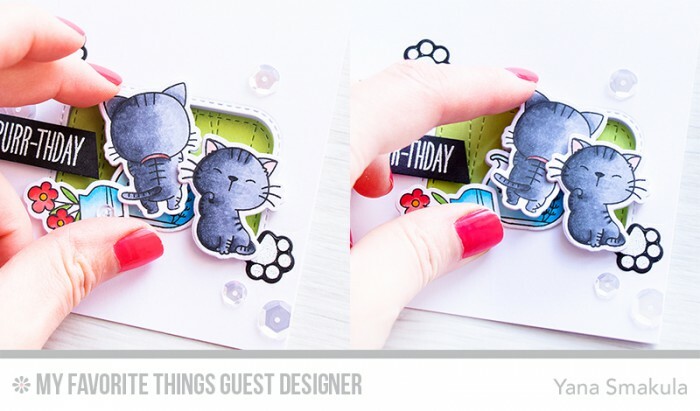 I’ve been enjoying trying my hand at interactive cards (I shared a spinner one a couple weeks ago) and I have a new one to share today, it has been inspired by our precious kitties. This card is also a guest project for My Favorite Things Blog. 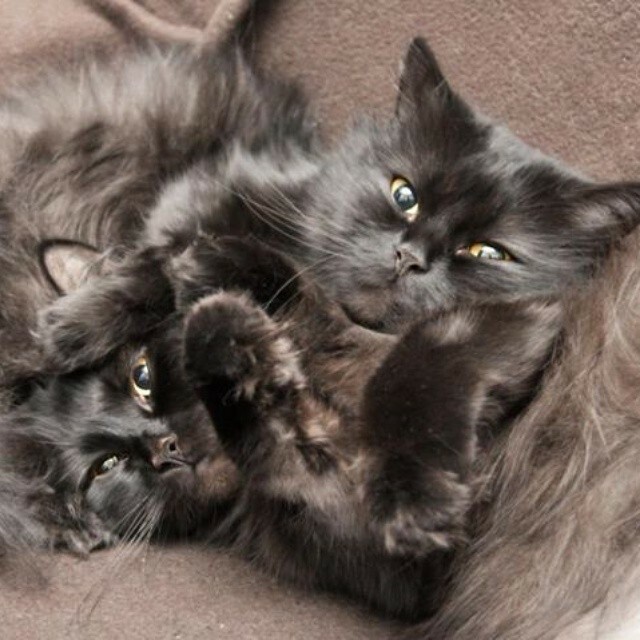 Usually our cats fight all the time, but when they don’t they become inseparable like on the photo above. They sleep together, they watch birds together and they plan what mischief then can do next together. We don’t have have an aquarium at home, but if we were to have one I would imagine I’d be seeing the scene I have on my card every day. If you look at the card you can see that one of the cats has taken guard and is making sure none of the adults are in proximity to interfere with their plans while the other kitty is trying to get into the little aquarium. 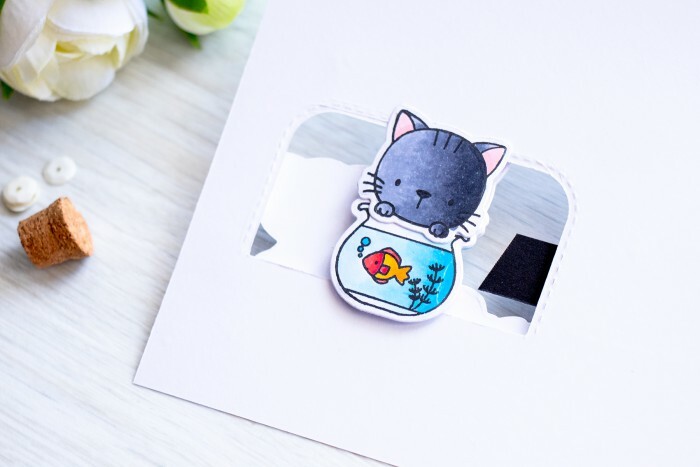 This is a window card (the window has been created using the Inside & Out Stitched Rounded Rectangle STAX dies and decorated on the inside using green cardstock and Stitched Strip Die-namics), so when you open it you can see the kitty’s face and the fish bowl on the inside. 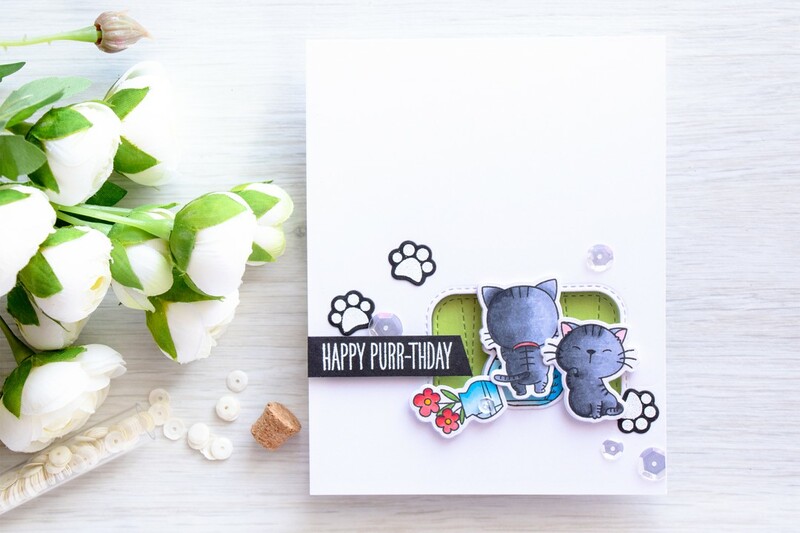 The stamp set that I used to stamp the kitties, the Cool Cat and coordinating dies, allow you to stamp the front and the back of one of the cats; the fishbowl image is symmetrical, so you can use the same image on the front and back helping you create fun interactive cards. I did say this was an interactive card and one of the kitties wiggles from left to right trying to get into the fishbowl and get the fish out. Quite fun I think. I also added a little vase with flowers, it was colored using Copic Markers (along with other images here, all stamped onto Copic X-Press It Paper) and was foam mounted for a bit of dimension. Want to know what colors of Copic markers I used? Check out My Favorite Copic Color Combos post. I’m listing Copic marker color combinations that I use most often. 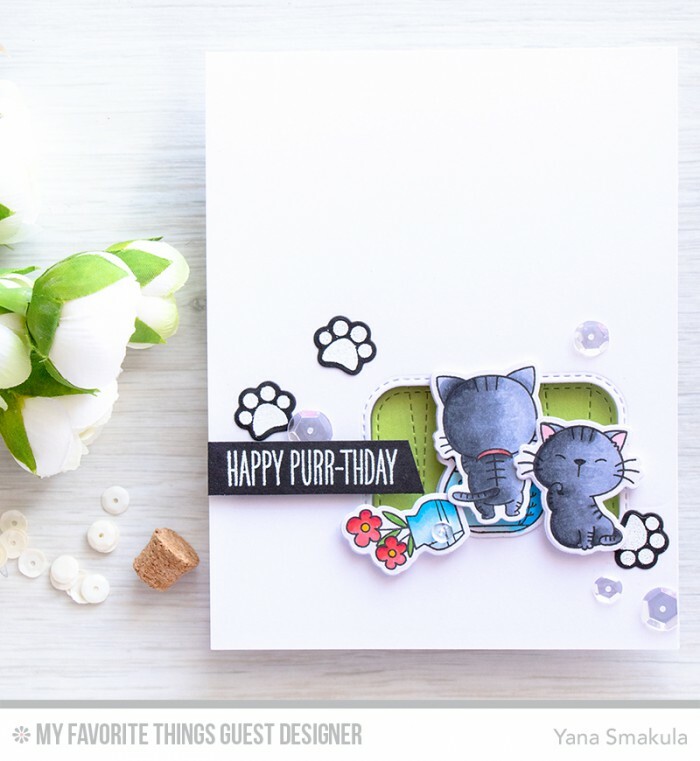 The card is also decorated using heat embossed and die cut paw prints, I used Wow Detail White Embossing powder to heat emboss them and the sentiment and I also added several clear sequins and little drops from Pretty Pink Posh. This card is too adorable!!! Kitties are so cute! Great scene!!! And YOUR cats are even cuter!! Those noses!!! Love!! I love your card ! This cats set is so adorable ! But I think I like even more your two gorgeous cats !! We also used to have two cats (mother and son) but the mother died last week. Even if, like yours, they were always fighting, now he seems so lost and sad without her ! oh I am so sorry, Izzy! Loosing a pet is always very difficult.